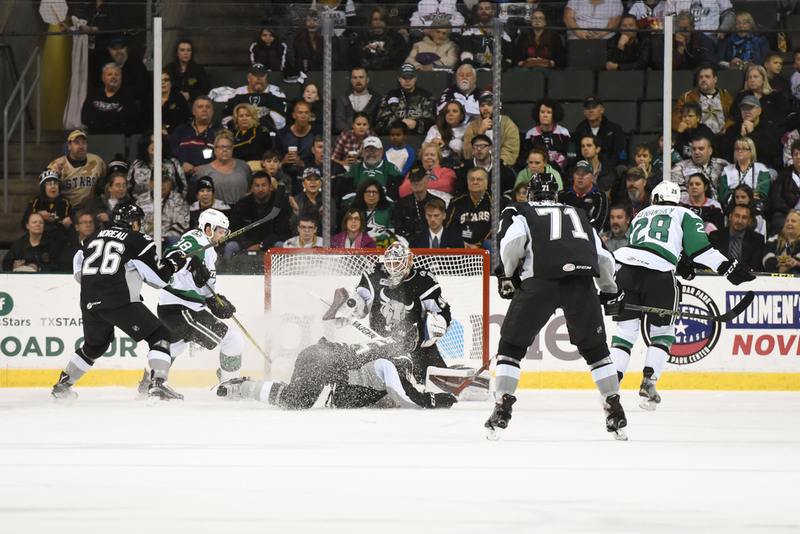 The Texas Stars faced rivals San Antonio Rampage at the Cedar Park Center last Saturday. After a scoreless first period and a frenzy of goals in the second, the Stars would end up trailing 4-1 in the third period. The Stars came alive in the last frame and got a couple more goals to tighten the Rampage lead. A tying goal eluded the Stars and they ultimately fell to the Rampage 4-3. The first shot is from the first period where the Stars dominated on the offense. They outshot the Rampage almost 2:1 but didn't find the net in the opening frame. The second shot, also from the first period, is an example of why you really have to stay alert as a hockey photographer. I was tracking goaltender Lagace coming out to play the puck and he decided to bank it off the corner, high on the glass. It hit directly in front of me and if it had been a little lower it might have found the hole in the glass where my lens was pointing through! The third shot is our guy Troock helping a Rampage player find a seat...on the wrong bench.